The coffee is brewing. The sun is shining through to the kitchen. The french toast is soaking. It's Sunday, and it is a good day. It starts with the best loaf of sourdough bread. If you have succeeded in not eating the whole loaf in a day... you just may be on your way to the best french toast you'll ever have. Using day old bread is key here. You want the bread to soak up the moisture from the eggs and milk. Begin with mixing up the eggs, milk, vanilla, cinnamon, nutmeg and orange zest. Slice your loaf as thin or as thick sliced as you please. It's the weekend, you deserve it. 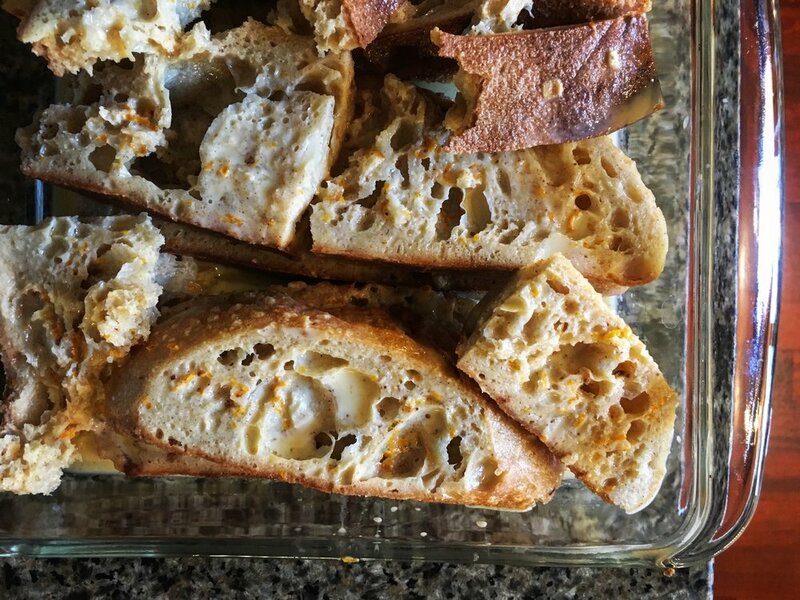 Place a slice of bread or two into the mixture and let sit for a few minutes, roll it a few times, fuss with it, make sure it's soaking all of the creaminess up. Place the soaked bread into a baking dish to rest. Repeat with the remaining slices. Once all of the bread has been soaked and placed in the baking dish, let it rest for 30 minutes. Feel free to daydream about the brunch you are about to experience, fill your mug with pipping hot coffee, and put your feet up. Heat your skillet to a medium to high temperature and coat with coconut oil. My favorite skillet to use for this is cast iron, but any pan will do. Place pieces of soaked bread onto the skillet and cook until both sides are crispy, golden and cooked through. Serve with butter or coconut oil, cinnamon and sugar or raw honey, and enjoy. Your taste buds rejoice!